I generally try to not over-hype films in my head before seeing them for fear of my expectations not being met. That being said, Gravity is a film that was hard to not over-hype…from the very earliest of screenings, critics have been raving about how it’s “the space film they always wanted” or “the best space movie ever,” etc. Despite the fact that I generally try to avoid critic reviews before seeing films so as not to color my own opinion one way or the other, I couldn’t help but see how much people were liking this movie, so the bar was high. And, my goodness, even that bar was far too low for a film like this. Gravity begins calmly enough; Lieutenant Matt Kowalski (George Clooney) is experimenting with a prototype jetpack during his final expedition before retiring, and Dr. Ryan Stone (Sandra Bullock) is making repairs to the Hubble Space Telescope on her first space shuttle mission. However, disaster soon strikes when speeding space debris appears, damaging the space shuttle and causing the astronauts to lose communication with Mission Control, rendering the pair completely alone. Tension is high as they navigate across space, fighting for survival against impossible odds. The only two actors appearing in the film (aside from voices) are Clooney and Bullock, who are both fantastic. Clooney’s character carries the same sort of assured confidence that is always attributed to him, but it doesn’t feel canned or overly familiar; in fact, it’s a comfort in the film, as his character is the voice of reason and determination in a desperate situation. Bullock’s performance is what truly carries the film, though, with her inspiring growth from damsel in distress to her struggle in finding hope to her resolve to survive. It’s an intimate role in that it is often literally her, space, and the audience alone together, so we spend a lot of time in her head seeing what she sees and feeling what she feels. Speaking of seeing what she sees, the cinematography is often used as a tool to change audience perspective. In one scene, the camera shifts from us looking at Dr. Stone in empty space, alone, with us watching her panic as she spins out of control, to inside her helmet, watching the world and the destruction of the space shuttle come in and out of focus as we spin with her. This perspective shift makes an intimate performance even more intimate because we literally experience the same thing that she does. The camera work is also incredibly beautiful; as Kowalski and Stone venture across space together, we are treated to wide open shots that show their relative insignificance when contrasted with the enormity of Earth and the space that engulfs it. Our perspective is shifted again as we see shots of the two of them against the backdrop of Earth during times of hopefulness, but we see them with nothing but black emptiness in the background when all hope seems to be lost. It’s an incredible technique that is as awe-inspiring as it is terrifying. Despite the wide-openness of the setting, the great irony of the film is that you often feel claustrophobic; being confined alone to a suit in the middle of an oxygen-less emptiness is a scary feeling. I purchased the film’s score, composed by Steven Price, a couple of weeks before the film was in theaters. From the very first track, I was stunned by how well the music is able to embody and facilitate the claustrophobia of the film. Much of the score is more atmospheric than musical, relying on random electronic beeps (as if from warning beeps from the astronauts’ equipment) and deafening “whirrs” to evoke feelings of disaster or extreme peril. Perhaps even more incredible are the moments in the film that don’t use music at all, perhaps bringing the claustrophobia to even greater heights. Obviously, there is no sound in space, so these moments are especially profound and, in a way, sobering. There are times of beauty, though, heard in the film’s rare instances of peace, such as in the track “Airlock,” that hint at the final track on the soundtrack, “Gravity,” which is heard in the final moments of the film. It’s a hugely satisfying moment that I don’t want to spoil for you here…just enjoy it when you see the film for yourself. It has been quite a while since I’ve been as blown away by a film as I am by Gravity. It is one of those rare films that manages to both awe and inspire its audience in terms of story, characterization, and visuals, and it does so without ever becoming boring. I saw the movie in IMAX 3D, which I would highly recommend; the 3D is utilized well, actually engrossing you further into the film by making you a part of the action on-screen. 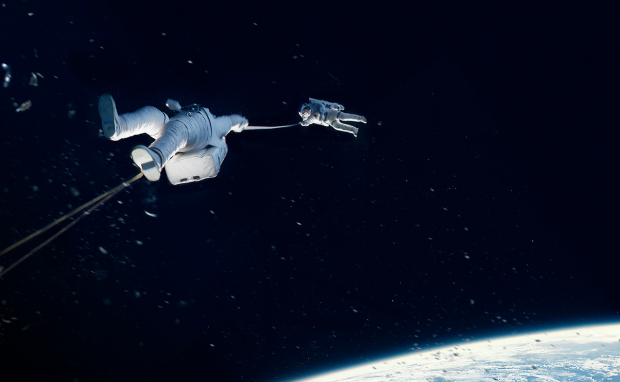 Cuarón delivers on every level here…Gravity is a masterpiece. Oscar season is upon us, my friends. In the week preceding the release of Peter Jackson’s first film based on J. R. R. Tolkien’s The Hobbit, I avoided reading reviews or checking its Tomatometer over at RottenTomatoes.com, focusing instead on reading the book for the first time (my review here). In the book, we are introduced to a magical world of hobbits and wizards and goblins and dwarves, a world that was captured beautifully on the big screen in Jackson’s film trilogy based on Tolkien’s Lord of the Rings. To say that Jackson and his team had a lot to live up to is a bit of an understatement. While it isn’t as good a film as we might have hoped, The Hobbit: An Unexpected Journey still manages to do Tolkien’s original novel justice. The story is first presented from the point of view of the older Bilbo Baggins, played by Ian Holm, who is in turn writing the story down for Frodo, played by Elijah Wood, on the same day that The Fellowship of the Ring began. Of course, this was just the filmmakers’ subtle nod to the previous films, but it stands mostly independent of its predecessors. The advantage of the film to the book is that tales that were mentioned only in passing, such as Gandalf’s adventures away from the company, can be expanded and intertwined with the journey of Bilbo, Thorin, and the rest of the dwarves. Radagast the Brown, a wizard who was mentioned only once in the book, plays a larger role in the film, fitting in to a subplot that sets up the rise of Sauron for the story told in The Lord of the Rings. Through this subplot, we are re-introduced to Saruman the White – and it seemed to me that the filmmakers were hinting at Saruman’s corruption by Sauron, but that may be me looking too much into it. Much of this film is definitely exposition and explanation, which could not be avoided in order to properly introduce the audience to the task at hand; even so, the amount of time telling of the past rather than exploring the present is a bit frustrating at times. There are two extensive flashback scenes where we are told the stories of Smaug’s overtaking of Erebor and how Thorin cut off the arm of the pale orc, Azog. This second flashback is significantly different in the book; while Azog is certainly mentioned, he is not alive for the events of The Hobbit. I was curious to know why this would have been changed, but the story arc that it creates for Thorin allows for something that was in the book, the dwarves’ growing respect for Bilbo, to be better explained onscreen, since the film doesn’t have a narrator like the book does telling us what is happening in the characters’ heads. Speaking of the dwarves, it is difficult to keep up with who is who in the film because of our lack of time spent with each character. This isn’t too big of a deal since Thorin is really the most important of them, but it would have been nice to be a bit more familiar with each dwarf. My biggest complaint about this film is the special effects; they seemed cartoon-y and cheap. Azog, Gollum, the orcs, and the wargs are all heavily affected by this issue, and it literally made me cringe while watching. Perhaps part of the this can be blamed on the heavy use of CGI to create the orcs (versus the relatively CGI-free orcs in The Lord of the Rings), but I saw the film in IMAX 3D at 48fps, so I’m hoping that I can blame the poor special effects quality on the higher frame rate. Aside from the special effects, the higher frame rate didn’t bother me at all…it certainly took some getting used to, but the overall effect was a nice crispness that, while I can understand others’ disdain for it, I felt brought me further into Middle-earth. While Richard Armitage does a great job of embodying the nobility and perseverance of Thorin Oakenshield and Ian McKellen makes a splendid return as Gandalf the Grey, not enough praise can be heaped on Martin Freeman’s portrayal of Bilbo Baggins. He perfectly captures the wit, the reluctance, and the overall spirit of the hobbit created by Tolkien; there were plenty of moments in the film where all of my smiles and laughter were solely inspired by what he was doing onscreen, whether it was him reacting to dwarves invading his hobbit hole or his negotiating with Gollum or any other number of things. I walked into the theater for this film knowing that it probably wouldn’t be as good as Peter Jackson’s first venture into Tolkien’s Middle-earth, but I still had high expectations, especially after reading the original book. My expectations weren’t completely met, but I still enjoyed this film a great deal – minus the issues with the special effects. The other parts of the film that I didn’t particularly care for can be attributed to the fact that it’s meant to set up the rest of the story, which will be explored in the following two films. Despite its shortcomings, The Hobbit: An Unexpected Journey is fine storytelling, and I now have no doubt that there is plenty of material to create three quality films – which had been a doubt of mine before. I would personally recommend seeing it in 24fps if you can (3D or not doesn’t matter), but, either way, be prepared for quite an adventure! After viewing this film for a second time in 2D at the usual frame rate (24fps), I am happy to announce that my issues with the CGI were (mostly) resolved with the lower frame rate, and I have accordingly raised my original rating from a 3.5 to a 4. Whether you see it in 3D or 2D, IMAX or not, I would personally recommend you view The Hobbit: An Unexpected Journey and its sequels in the standard (non-HFR) frame rate. P.S. – Read my review of this film’s score, composed by Howard Shore, here! Unfortunately, Indiana Jones was not a household name in my family. As a child, I might have watched bits and pieces of the original trilogy every now and again, but I did not sit down to watch Raiders of the Lost Ark all the way through until I was a sophomore in high school. From the epic boulder chase scene onward, I was hooked, and I’ve been a fan ever since…I even dressed as him for Halloween a while back, and the brown leather jacket that I own and wear regularly is an homage to this iconic character. 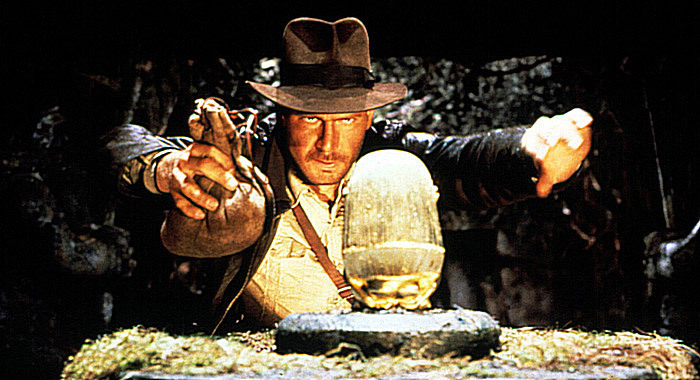 The appeal of Raiders of the Lost Ark isn’t its storytelling, its special effects, or its score. Though all of these aspects are fantastic, the real appeal of the film is Indiana Jones as a character, and, likewise, Harrison Ford’s performance within that character. A cross between James Bond, Han Solo, and the sort of swashbuckling adventure characters portrayed by Errol Flynn, Professor Henry Jones, Jr., is chock-full of surprises, whether it’s his witty one-liners, his narrow escapes, or his ability to keep track of his hat at all times. He’s not an overly compassionate hero, and he may be a bit of a jerk at times, but his heart is in the right place and we can’t help but love him. Perhaps the coolest part of his character is knowing that he’s a college professor and that his archaeological adventures are just a hobby on the side…imagine if you had a college professor travelling the world and punching bad guys in addition to his teaching position! The sets in this film are particularly spectacular, with the jungle at the beginning of the film and the Well of Souls being two of my favorites. Seeing Indy travel from a university to a tavern in Nepal to the streets of Cairo is a heck of a ride, and it all feels authentic and epic on a large scale. The action is fun and entirely fitting of Indy’s personality; the car chase scene is probably my favorite action scene of the Indiana Jones franchise, and who could forget the scene where an exhausted Indy shoots the scimitar-wielding Egyptian in the streets of Cairo? The characters on the side, especially John Rhys-Davies as Sallah, are lovable and memorable, with the Nazi villain Toht being one of the creepiest I’ve ever seen. Raiders of the Lost Ark is a classic for a reason. While George Lucas has proven himself to be a nutcase over the years, his talent for creating an original concept and Spielberg’s talent for bringing life to a movie screen join together for this film, backed by John Williams’ fantastic main theme and score, making one of the most iconic characters and films of all time. When I saw it on the IMAX screen a few months ago, it was as magical as if I was seeing it for the first time, so, in that sense, it is timeless and more and more fun every time I watch it. I just got home from the midnight showing of Marc Webb’s The Amazing Spider-Man in IMAX 3D, starring Andrew Garfield, Rhys Ifans, Emma Stone, Denis Leary, Sally Field, and Martin Sheen. I’ve been excited for this film since I first heard that it was being made and that Andrew Garfield, who I loved in The Social Network, had been cast in the lead role. Being a big fan of the first two films of Raimi’s trilogy (because we all know that Spider-Man 3 was just awful), I had high expectations for this reboot, and it didn’t disappoint. What really stood out to me about this film is that it showed that it’s truly just a man behind the mask, and a young one at that. Peter adapted to his new powers a bit slower in this film than he did in Spider-Man (2002), which really added to the realism that the film presented. His movements were clumsy, and it took him most of the film to truly adapt and adopt this new persona that was introduced into his life. Nothing came naturally to Peter in this film, which was a bit of a breath of fresh air after seeing the character almost instantly fall into the role of Spider-Man in the original Raimi film. In addition to seeing Peter’s human personality, we also saw that he has human relationships with other people. He argued with his aunt and uncle, he fought the bully who had tormented him throughout high school, and he stumbled through conversations with the girl he had a crush on. These are all sides of Spider-Man that members of the audience can relate to, despite the fact that he has spider powers and we (I assume) don’t. Spider-Man has the word “spider” in his name, and we really see the spider side of him in The Amazing Spider-Man; in fact, we occasionally see the spider side of him take over the human side, such as when Peter accidentally fights several guys on the subway ride home one night. There is another instance when he uses webbing to detect movement down the sewer, a trick out of the Spider Scout Handbook (again, I assume). Webb aimed for a more intimate and personal Spider-Man in this reboot, and he succeeded. Uncle Ben’s death (oh, come on, you’ve all seen the first movie) is more directly related to Peter than in the original film which makes it all the more emotional. Plus, we see Peter’s relationship with Gwen Stacy develop as the movie goes on, rather than in the first film when it sort of just happens. Speaking of Gwen Stacy, Emma Stone was lovely as the blonde love interest to Peter Parker, and it was nice to have someone who knows Peter’s secret so that he has someone to confide in. I’m not sure if I like Spidey being alone in his secret or having a confidante more, but I certainly don’t dislike Gwen knowing. Rhys Ifans as Dr. Connors/The Lizard was decent, but I must admit that Alfred Molina’s Doc Ock from Spider-Man 2 was a better, more fleshed-out character. Though the CGI/motion capture allowed Ifans himself to become The Lizard, the transformation took away the human side that we want to feel compassionate for, at least for me. I know that the only things he wants are his missing arm and to help people, but it’s difficult to sympathize with a giant, scaly monster. That’s no fault of Webb or Ifans, though. Garfield’s Spider-Man was pretty fantastic. I’ll admit, I haven’t read a lot of Spider-Man comics, but I have read a few, and Garfield did a great job with capturing the witty, sort of big-headed personality of the Spidey created by Stan Lee (who had a hysterical cameo in the film). They did a great job with showing us that he was smart, too, so that it wasn’t hard to believe that a teenager was capable of creating web-shooters and what-not. Sally Field, Martin Sheen, and Denis Leary were all great to see as well. Field and Sheen, as Aunt May and Uncle Ben, played more believable parent-figures than the actors of the original trilogy, with them acting more like parents than as people who were watching over their friend’s child, as they should. There were a few little details that I sort of geeked out over. First, when Connors runs amok as The Lizard, he predominantly uses his right arm, the arm that is missing when he is human; whether or not this was a conscious choice by Ifans or Webb, I don’t know, but it helped me to feel for the character a bit more. The flash of the web-shooters as they were used was consistent, which isn’t a huge deal, but it still managed to make me smile. I feel like The Amazing Spider-Man left us in a better place than the Spider-Man did. We have yet to figure out what happened to Peter’s parents (a short scene mid-credits makes us question it even more, so stay for a minute or two after the credits start rolling! ), and we are curious to see where Peter and Gwen’s relationship will go, both of which can be explored further in the sequel. I’m curious to see who the next villain will be. I hope it won’t be someone we’ve already seen in the original trilogy…unless they can bring back Venom and do the character justice. Overall, The Amazing Spider-Man is a reboot that brings new life to the character. We see Spidey’s more human side, we see his more human relationships, and we get a sort of realism that was absent from Raimi’s trilogy. This new Spider-Man universe more believably fits into our own world, whereas Raimi’s was still partially in the comic world. There were flaws, yes, but this was an origin story, after all. Webb’s re-imagining of the character introduces new opportunities that I can’t wait to see on the big screen in the future. P.S. – Read my review of this film’s score, composed by James Horner, here!